Ever get the feeling that someone or something is watching you? 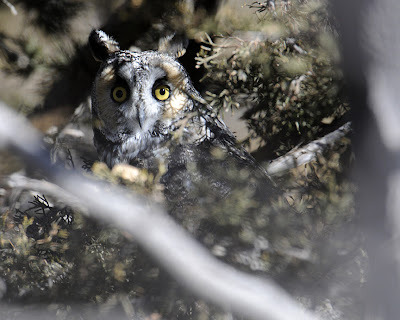 For some folks this is a spooky feeling to get while traipsing around in remote areas, but it's a good thing if you are looking for owls like I was on the Bonny Christmas Bird Count held last weekend in Eastern Colorado. 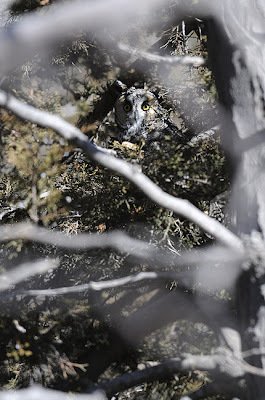 Long-eared Owls like dense roosts in junipers, Russian Olives, etc. and this spot didn't disappoint. 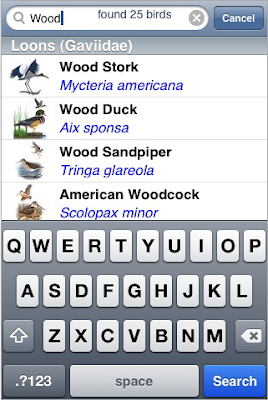 More generally, this type of bird guide (along with Windows Mobile apps like National Geographic Handheld Birds and Pocket Bird Recorder) offers extreme portability, the ability to integrate multimedia like sound files (can video showing behavior traits be far away?) and checklisting capabilities. (Like how I made a verb out of checklist? 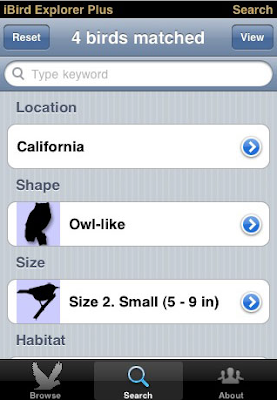 Maybe I should trademark that if someone hasn't already done that...) I have a feeling that more iPhone birding apps will debut in 2009- is the era of guidebook 2.0 getting into full swing? I've previously posted about how to use Google Earth to plot out a Christmas Bird Count circle (mainly riding on the coattails of Bootstrap Analysis)- a great way to virtually scout and see count territory boundaries, etc. Recently, I had correspondence from Chris Hill who decided to use Google Maps to set up his count circle territories, citing the ease of sharing the maps and for the potential of letting others add to the map, too. The only hitch seemed to be getting a good 7.5-mile radius circle drawn- Google Maps has line & polygon tools but not a circle generator. Curious, I did a search and it turns out that you can import a .KMZ file that Google Earth generates into Google Maps- easy directions are posted on the Google Lat Long blog. Ba-boom- the best of both worlds. You can work up your circle &/or territories in Google Earth, import it into Google Maps, and then share the URL with whomever. You can even embed the Google Map in your blog or other web page- see below. Then you link to the free KML Circle Generator, plug in your center coordinates, and set the radius to 12,070.08 meters (the equivalent of 7.5 miles.) This will return a link that you follow to download a .KML file which will open in Google Earth as a nice circle demarking your count boundary. Right-clicking on it and selecting "Properties" (or "Get Info" on a Mac) will let you re-name it, change the color, change the thickness, change the opacity, etc. Then, if you want, you can use the line, polygon, and placemark tools to further divide and/or organize your circle. I also put a placemark at the count center. Now you've got a collection of map elements that you can save as a .KMZ file by right clicking on the folder and choosing that option. Finally, go to Google Maps and choose the "my maps" option. Select "create new map", and give it a name. Right above the name there are two links- "collaborate" and "import". Choose the import option and find your .KMZ file wherever you saved it. Google Maps will pull the circle and whatever else you created in Google Earth to your new custom online map. You can further edit it in Google Maps with the line tool, polygon tool, placemarks, etc. I haven't explored the feature much, but using the "collaborate" link lets you give editing privileges to others. Once your map is ready and saved, you can use the print, send, and/or link options to share it with others. 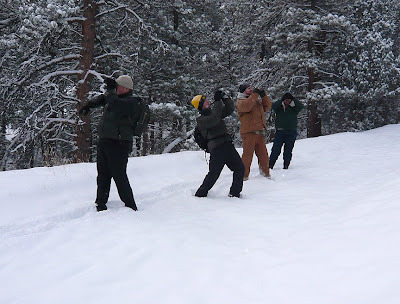 The 67th Boulder Christmas Bird Count was held last Sunday, which also happened to be the coldest day of the season so far (with record-setting cold later that night!) I compile the count and was a nervous wreck worrying that we'd get shut down by the weather. The count is traditionally scheduled for the first Sunday of the count period (Dec. 14 - Jan 5) and with 30 territory leaders and usually over 100 participants, the show almost has to go on- there is simply too much inertia once everything is in place to just decide to postpone for a day or even a week (barring, I suppose, the storm of the century or something.) So out we all went, with 4-5 inches of fresh snow and temperatures a few degrees either side of 0. 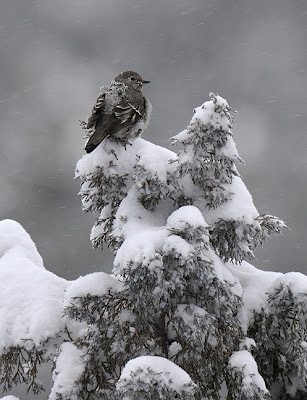 This Townsend's Solitaire kind of sums up the feeling of the day- cold, snowy, but beautiful. 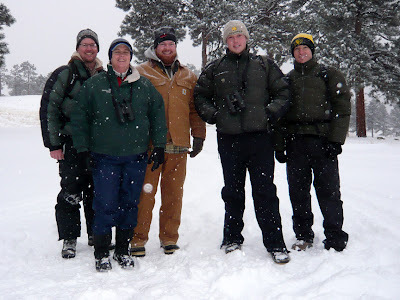 My team of hardy birders (below, from left: Yours Truly, Connie Kogler, Dave Alcock, Mike Freiberg, and Dan Maynard) went up in the Boulder foothills to an open space park called Betasso Preserve. 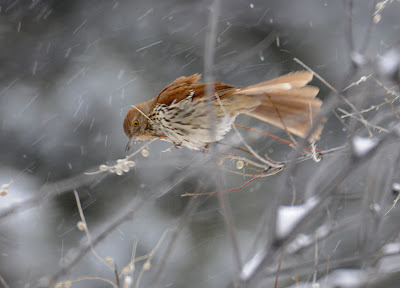 Our second bird of the day also turned out to be our best- a very chilly Brown Thrasher subsisting on Russian Olive berries bordering a horse corral. 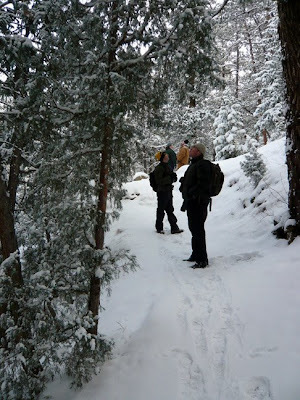 Beyond that the birding was kind of slow but we had some nice montane species and it was priceless to walk a 3-mile loop in a typically busy mountain park with the only tracks before us in the snow belonging to deer, squirrels, and rabbits. 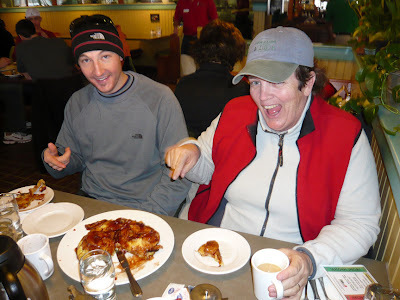 Once we wrapped up in the mountains, we descended to warm up, re-group, and get a bite to eat at The Original Pancake House in Boulder. The host took pity on us and produced a huge complimentary apple pancake to nosh on while waiting for the rest of our orders. 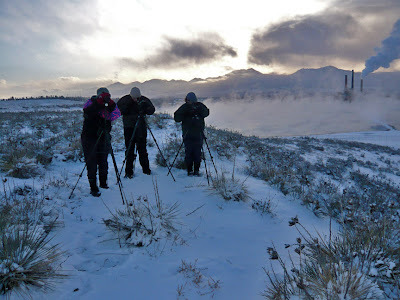 Re-stoked and warmed up, a few of us headed back out to surmount the mesa in the midst of the Valmont Reservoir complex, lakes warmed by a power plant nearby and often chock-full of great birds. Divers like Double-crested Cormorant and Western Grebe overwinter here in small numbers, the only location in the count circle for such species that would normally depart for warmer climes. Unfortunately, the combination of relatively warm water and very cold air (about -5 F by then) produced very foggy conditions. Still, we gave it a go, sometimes glimpsing birds through quick gaps in the fog like a raft of about 75 Red-breasted Mergansers. Earlier in the day, a team had covered the territory from inside the fenced complex (permission and chaperone required from Xcel Energy) but had missed seeing any of the Western Grebes that should have been out in the fog. Fortunately, from our higher vantage we could hear at least one give its kree-kreeee call- tick it! I'd like to thank everyone who braved the cold to participate in the Boulder CBC. We were able to add one new species to the all-time list (bringing it to 206) with a Great Black-backed Gull, and other highlights included Western Bluebird & the aforementioned Brown Thrasher (each the 11th time on count day), Lesser Goldfinch (9th time), Eared Grebe & Hermit Thrush (each for the 5th time), Lesser Black-backed Gull (4th time), and Brown-capped Rosy-Finch (3rd time, complimenting Gray-crowned's 14th appearance.) Next year will be the 100th aniversary of the Boulder count, which was first run on Dec. 24, 1909. It's going to be big so make plans to join us on December 20, 2009! Meanwhile, there's plenty of time to join another count this year- you can find one on Audubon's Find a Count Circle page. Back in October when I visited the Bay Area in California I was tickled to get some nice photo opportunities featuring Golden-crowned Sparrows. 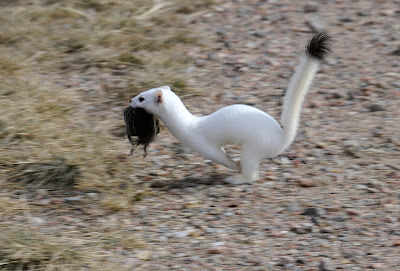 I don't get many chances at these (they rarely vagrate into Colorado) so seeing them and hearing their vocalizations was very cool. 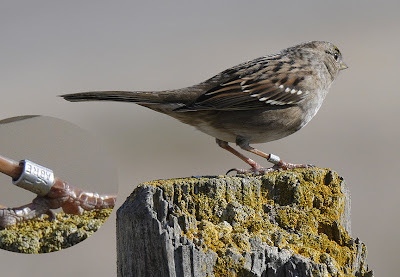 One that was perching cooperatively at the Palo Alto Baylands sported a band- sweet! As I was editing the pictures I realized that I could make out lots of numbers, so I enlisted the help of some bander friends of mine who knew their way around banding codes. From the various angles, they figured out that only the first number of each sequence was missing (?###-?####). 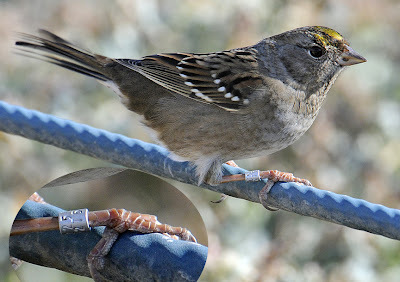 With that information, there was a chance of figuring out the exact number (for example, the first number in the prefix was likely a 0, 1, or 2 based on the band size that Golden-crowned Sparrows take, and from that sequence, perhaps only one of the used band numbers in the 5-digit suffix was from a Golden-crowned Sparrow.) From there I chatted with a very helpful person at the USGS Patuxent Wildlife Research Center Bird Banding Lab (the national clearinghouse for bird banding information), who couldn't come up with a match at the time but promised to look into it. 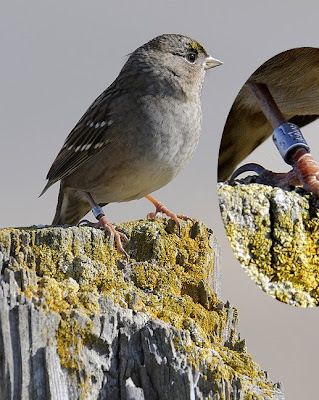 Look into it she did, and I got an email today that they were able to nail down the band number and the information on the bird, which I then formally submitted on the band reporting site. 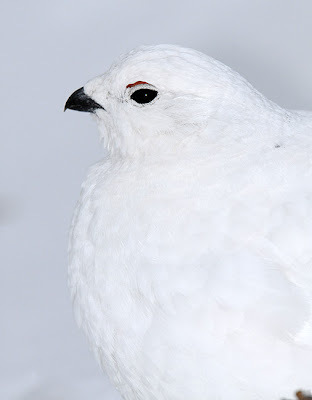 Turns out the bird was banded on 15 April 2008 within a few hundred meters of where I saw it on 10 October 2008. 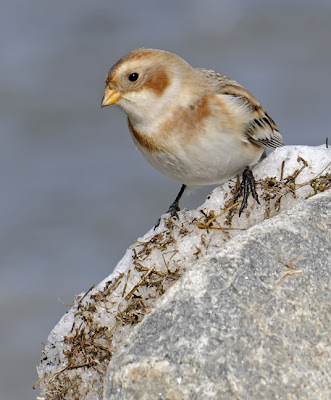 In the intervening months it migrated north, as Golden-crowned Sparrows breed near treeline in Brittish Columbia, Yukon, and Alaska. 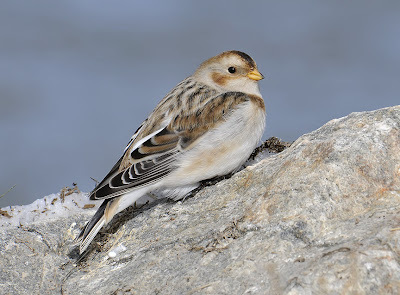 Then it came back again to its wintering territory at sea level on the southern San Fransisco Bay area- nice round trip and very tight site fidelity! 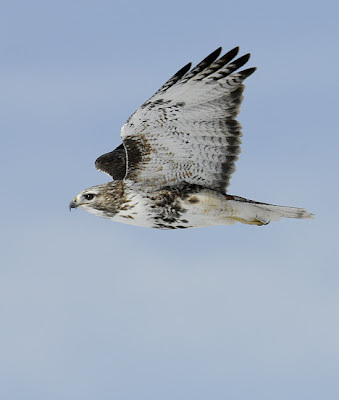 I was tickled to hear from a friend that the light-morph Harlan's Hawk (harlani subspecies of Red-tailed Hawk) I found last year was back again on the same winter territory. 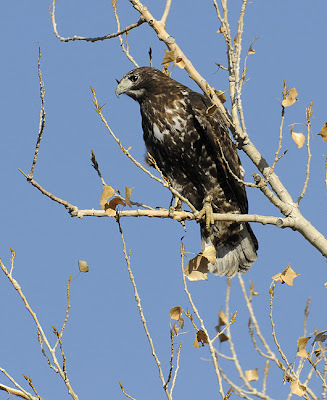 I had looked along the row of power poles where I saw it last winter a few times without success, but yesterday I packed up my camera and good luck charm (my son Garrett) and we took the road less traveled on our way to do a few errands, cruising the strip south of Hygiene, Colorado, to see if the bird was there. Sure enough, it was on practically the same power pole as last year! When I snapped it last time, it was eating something, allowing me to get pretty close for posed pics but I never got anything good in the way of flight shot. This time it was kind of flighty, only allowing moderate-distance posed pics. 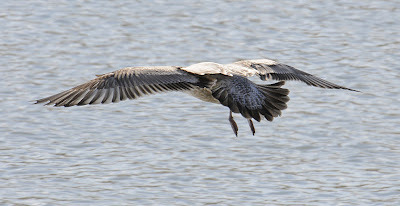 But much to my delight, instead of flying away it flew along right past me. It wanted to stay on the power poles next to the road (probably waiting on rodents in the grassy strip between the road and a field beyond), and would shift three or four poles south each time it flew, allowing me to repeat the photo opportunity several times (I stayed in the car and shot from the shoulder of the road.) 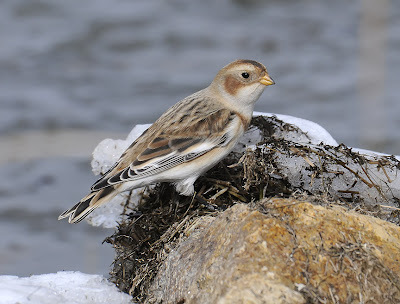 Not only that, but the magic combination of sunshine and snow on the ground really lit up the bird nicely. 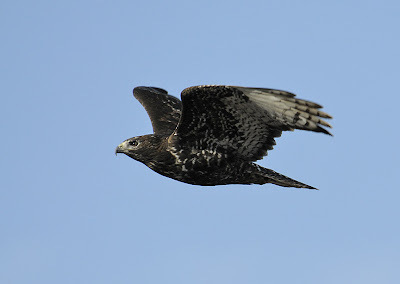 Rare bird, flying close by, in about perfect light- priceless! 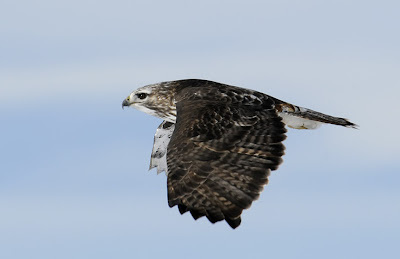 In my last post about the bird, my buddy Jeff Bouton said he hoped for continued reports and more images. Here you go, amigo- better late then never! I spent today with gulls in a snowstorm, keeping them happy with stale popcorn and bread in hopes of luring an immature Mew Gull into photo range without luck. It was cold, windy, snowing, and dark. Lack of cooperation (by the bird & weather): uncool. The only saving grace was the custom lens & camera cover that my wife made for me, keeping me in business for a few hours without worry of soaking my rig with melting snow. 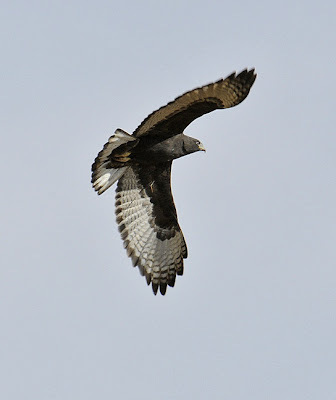 Last weekend, however, I ran into an uncommonly cooperative Harlan's Hawk (harlani subspecies of Red-tailed Hawk.) I knew I was in business when a jogger with a dog stopped directly underneath the perched bird and it didn't flush- Cool! Not only was it tolerant of such direct approach, but it made 4 forays into a field with tall grass & weeds, staying down long enough each time for me to re-position with the light behind me to get flight shots as it came back up to the cottonwoods over a bike path to peer some more into the field. Definitely the most cooperative Harlan's Hawk I've run into so far. 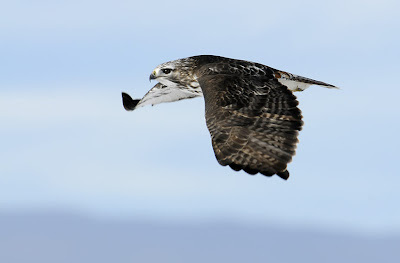 A few of my hawk-pro friends agree that it is a 2nd-year bird (born two summers ago), having retained the outer 4 juvenal primaries (7-10) and a juvenal secondary #4. Those feathers, being older, are bleached a bit. 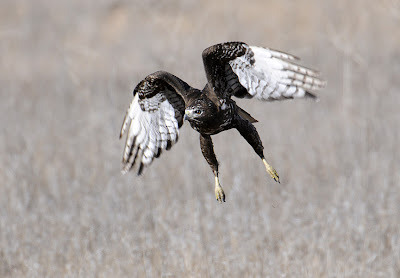 Otherwise it's dark eye and plumage are typical of an adult intermediate-morph Harlan's Hawk. 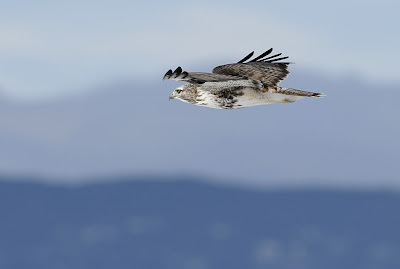 Anyway, my buddy Christian Nunes spotted an intriguing large 1st-winter gull with a very pale head at 6-Mile Reservoir on the north side of Boulder yesterday about mid-day. 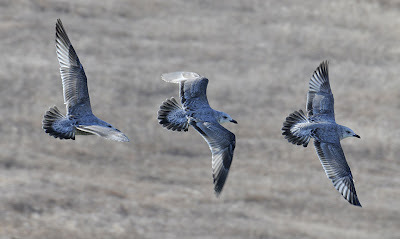 Fellow larophile Tony Leukering got the call and the two studied the bird enough to realize it was a good candidate for a Slaty-backed Gull. 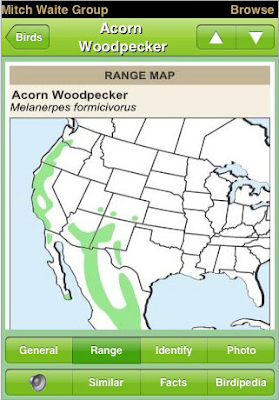 That's a great bird anywhere in the US, but especially rare away from the Pacific coast. 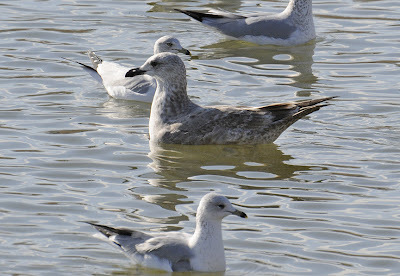 Colorado has one previously accepted record of this species (one of 21 gulls on the state list), but I had never previously seen the species, either in Colorado or anywhere else. 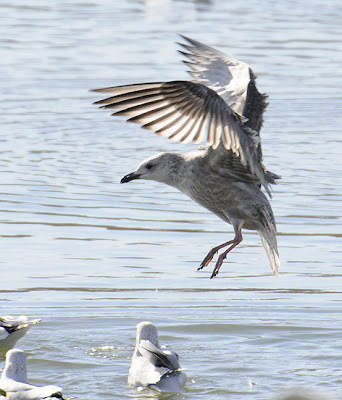 Yesterday afternoon I got some distant digicsoped pics of the bird, but today I was able to get much better pics thanks much to the bread and sardine-flinging efforts of anther gull savant, John Vanderpoel. The sticky point seems to be that 1st-winter hybrid Herring x Glaucous-winged Gulls may be nearly indistinguishable from 1st-winter Slaty-backed Gulls. 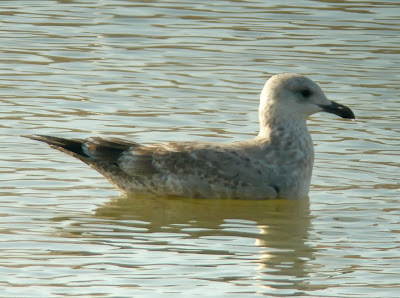 Some young Herring Gulls may share much in appearance, too. 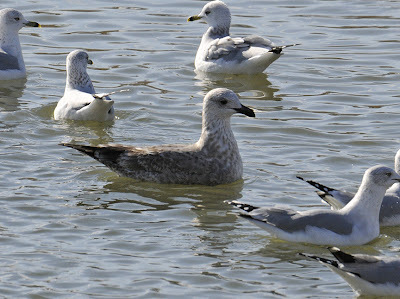 Early opinions from several gull experts differ- some whom I deeply respect are leaning towards the presence of Herring Gull genes, while others are leaning towards a "good" Slaty-backed Gull. A couple of online references I'll be sorting through include this Gull ID page and a page with all ages of Slaty-backs from Japan. 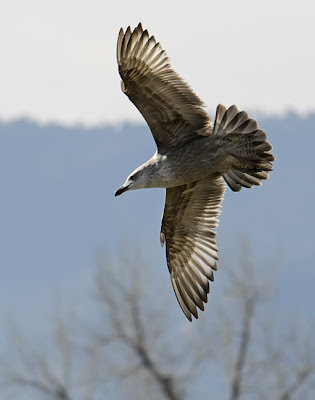 I'll also rely on my Gulls of the Americas and Gulls of North America, Europe, and Asia in addition to the standard field guides as I look into the case more. 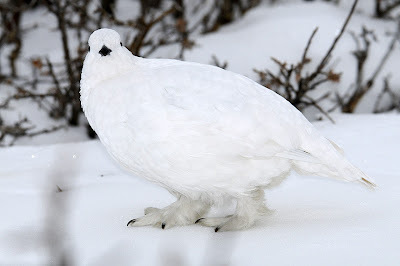 In any case, I'm posting these pics for folks to study and form their own opinions of what the bird is or isn't. Hey folks- my birder buddy Noah Strycker has a great blog detailing his Antarctic adventures studying Adelie Penguins for three months with two other researchers at a remote outpost on Cape Crozier. 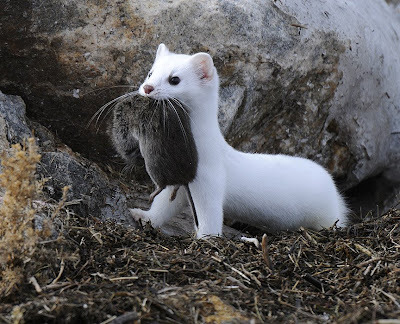 Living conditions are austere, the weather defines harsh, and the work is hard, but his updates are filled with amazing photographs and witty writing (no surprise, coming from Noah!) The following is his description of the blog- be sure to visit and leave a comment or two! Noah Strycker is spending this season in a field camp on remote Cape Crozier, Antarctica, with two other researchers and several hundred thousand Adelie Penguins. Adverse weather, cramped conditions, and isolation are usual. 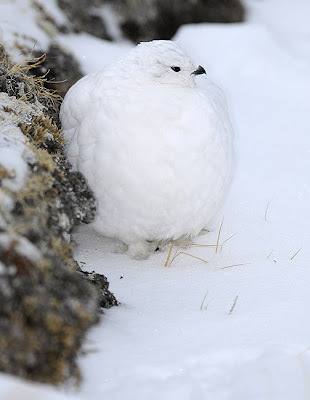 This blog covers day-to-day life on earth's driest, coldest, windiest, most southerly continent. Noah is a 22-year-old recent graduate of Oregon State University in Fisheries and Wildlife. 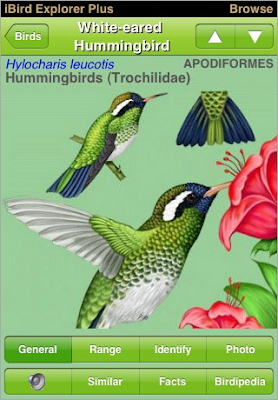 He is Associate Editor of Birding magazine, columnist known as BirdBoy in WildBird magazine, and a passionate birder, artist, and photographer. Contact him or see more of his work at noahstrycker.com. Penguin Science research is ongoing. You can learn more about the project at penguinscience.com. 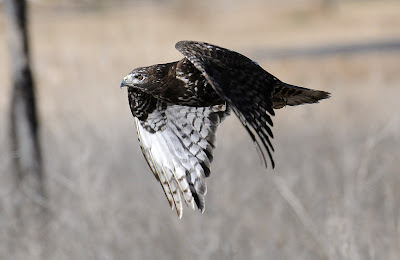 In contrast with the white wildlife I featured in my last post, here's a dark-morph adult Harlan's Hawk (harlani subspecies of Red-tailed Hawk) that I saw on November 1 and again today. 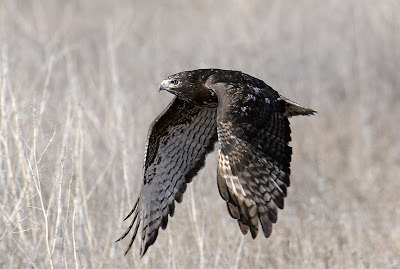 If you've followed my blog for a while you'll know I like dark hawks about as much as any bird, and they don't get much darker than this. 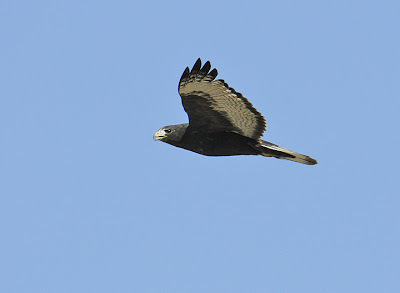 Still, it has a few white streaks on the breast, typical of harlani as opposed to dark-morph calurus (western) Red-tails. I first saw and photographed this individual in December of 2005, and it has been back to the same winter territory every year since. The bird is a tricky devil to photograph, though, usuall flying from its roadside power pole at the first sign of deceleration on my part. Fortunately, it sometimes flies along parallel to the road, heading for another power pole, allowing some shots in passing. 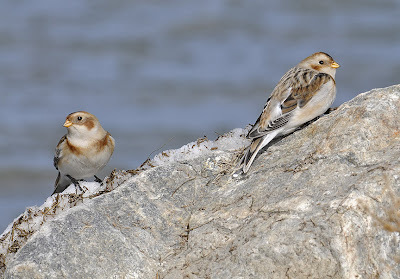 After the weasel incident, I didn't have to wait too long until the Snow Buntings came along, alerting me by their call. They foraged among the rocks and the wrack piled up on the lake side, offering some great poses. These are my best shots of the species so far. I took one more detour on the way home, 4-wheeling through snow to the top of Guanella Pass in search of White-tailed Ptarmigans. 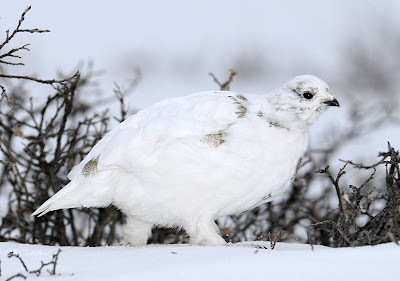 I see them about every summer when they are brown and mottled to blend in with rocks and tundra vegetation, but hadn't seen white birds in their winter plumage for quite a while. 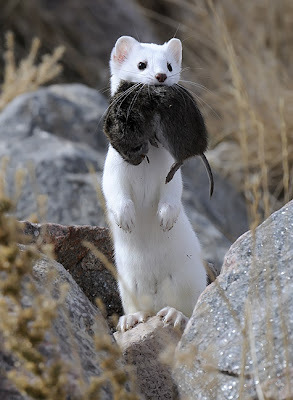 Finding them is harder now that the road to the top of the pass doesn't get plowed (it used to stay open all winter), but I found the right timing this year. 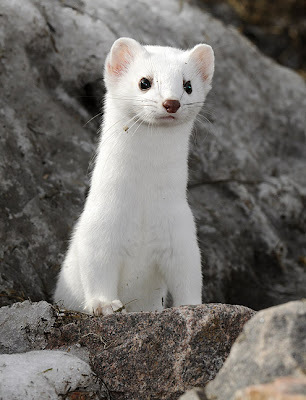 I could still reach the top (but a non-4wd car wouldn't have made it), and there was enough snow on the high slopes above timberline to attract wintering ptarmigans. 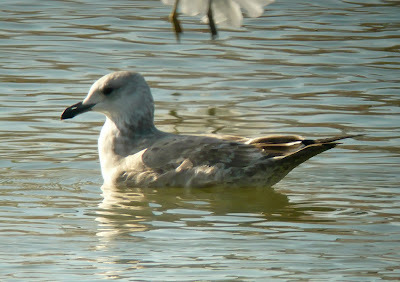 Most were pure white, but a few had a smattering of summer feathers left to molt. 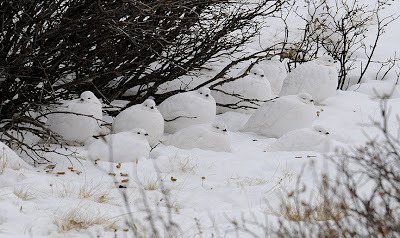 The challenge is finding these snowballs on a white mountainside. They like dwarf willows whose tips are sticking out of drifts, providing easy bud picking. 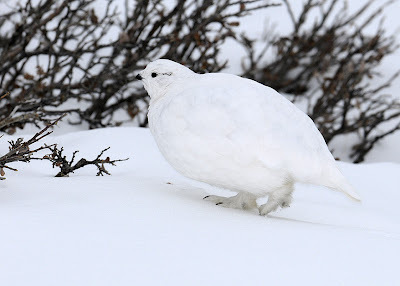 This is the only bird I can think of that I usually find by following tracks- while they can easily fly they prefer to walk around and those snowshoe feet leave distinctive trackways. Droppings are also a good sign that you are in an area they like. 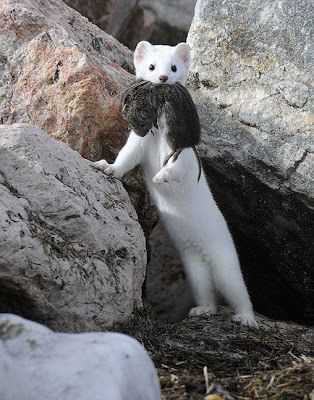 If luck is with you, a white blob will suddenly move out of your way, and then you're in business. 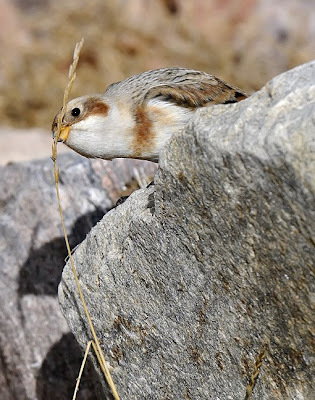 As long as you move slowly, the birds stay very relaxed, continuing their feeding and little vocalizations or snugging down out of the wind to relax. I talk to them as I move around for better angles, figuring that a predator would never be that visible & noisy. 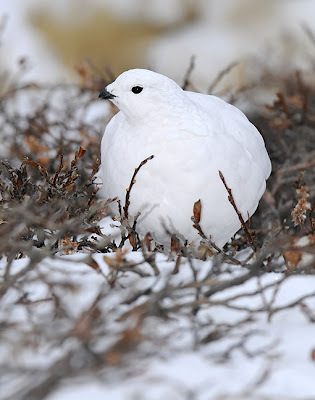 I'm sure it would be a comical sight to see me chatting it up with the plump little white birds, plopped down in the snow to get a ptarmigan-eye view while they go about their business.